Practice what you preach, they say. As of late 2013 and early 2014 I’m excited to reveal that this is exactly what I’ve been doing. 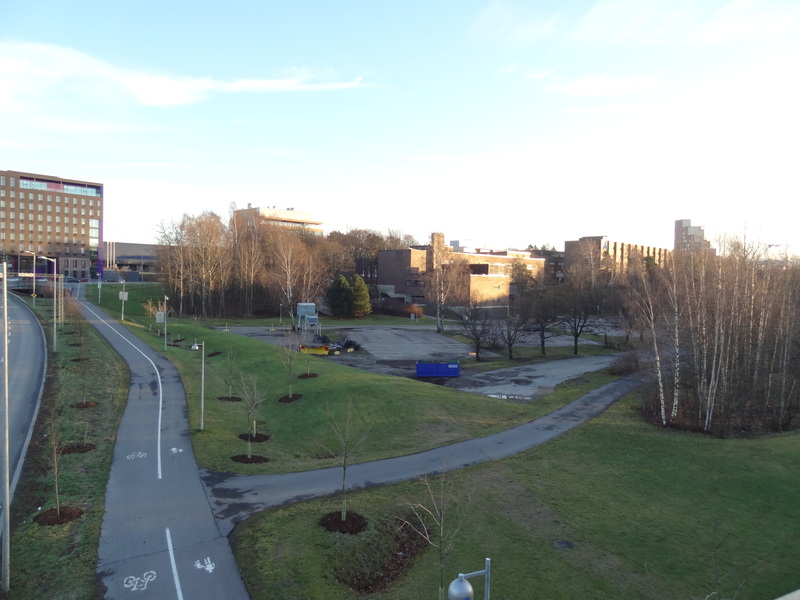 Helsinki’s City Planning Department is in the process of expanding the city into a 5.5 hectare piece of land on the northern edge of a neighborhood called Pikku Huopalahti that now hosts obsolete university buildings and green buffer zones. I’ve had the privilege of being a member of a seven-strong team of passionate and creative urbanists who have taken the initiative of illustrating our own interpretation of what the area could look like in the future. More than anything, we are determined to introduce the “urban” back into Helsinki’s urban planning. Our message with this plan is ‘no more sprawl’. 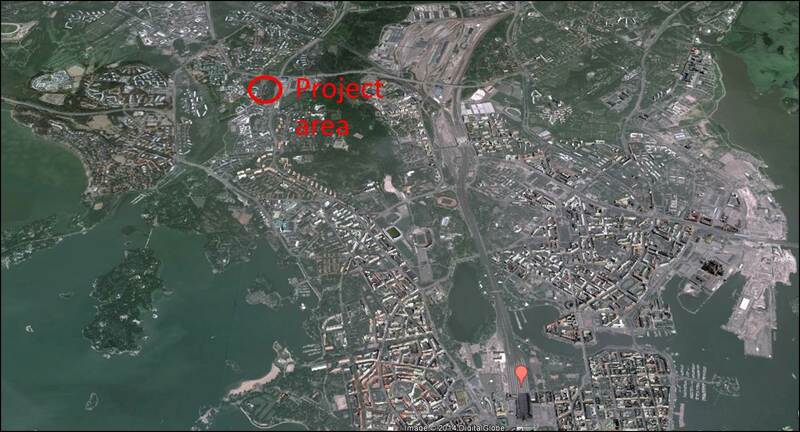 The project are is located at the northern edge of the inner city in Western Helsinki. Map courtesy of Google. This is how the site looks like now. We’ve now submitted our plan to the City Planning Department for it to be reviewed along with the official development concepts that three consulting firms have drafted. It’s too early to speak about any impacts and we have not yet received our feedback, but I nonetheless want to discuss why we are doing what we are doing and why it’s very interesting to follow the process from a wider perspective too. In our hands the area would transform from nothing to a neighborhood we named Haaganpuro. A visualization from the street Mannerheimintie that runs past the project site. Illustration by Niilo Tenkanen. Our vision is to introduce a neighborhood – which we named Haaganpuro – for about 4 400 inhabitants and 1 000 jobs. 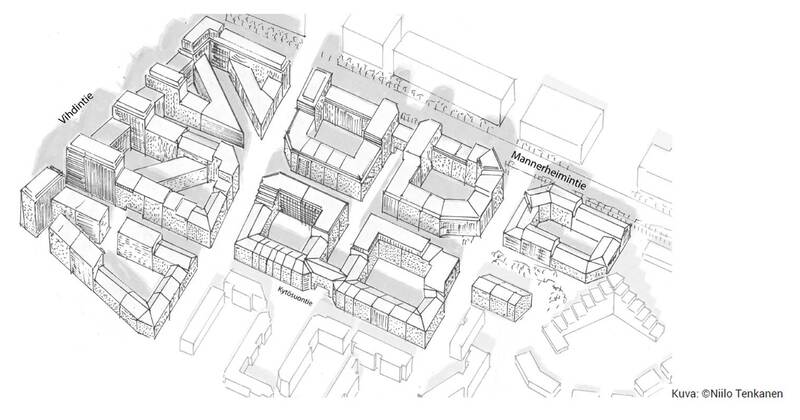 53% of the site would be used for buildings, 28% for streets and 19% courtyards and green space. In addition, 60% of the buildings’ roof surface area would be allocated for roof-top gardens and terraces. Shops would be set along the streets and a large supermarket underground to save space. Walking, cycling and the use of public transportation are stressed in the plan at the expense of driving. The building stock in our plan consists of 6-17 –story apartment buildings which draw inspiration from Helsinki’s most loved neighborhoods such as Punavuori, Kallio and Töölö. Emphasizing on Helsinki’s urban heritage and future needs is the classic New Urbanist concept of re-introducing time-tested planning solutions. We are keen on re-introducing the urban block in our proposal. Illustration by Niilo Tenkanen. 1) Helsinki is suffering from a chronic housing shortage. More people want to move in that the city supposedly can handle and this has been the case for as long as I can remember. As housing prices have gone astronomical, decision-makers have recently pledged stronger than ever to speed up residential development in order to catch up. Our 4 400 new inhabitants to Pikku Huopalahti compared to the city’s initial ball park of 1 500 is just what the doctor ordered. 2) Pikku Huopalahti is on the northern edge of the inner city and this is the one-time opportunity to use this particular piece of land efficiently. Business-as-usual planning solutions would not connect it to the inner city fabric but rather bring suburbia closer to the center. 3) Inner-city apartments are the most sought-after addresses based on comparing real estate prices. Building more of them just makes sense. 4) Urban blocks and urban space with real urban character has not been built in Helsinki for a good 60 years. Contrary to popular belief, Finns are not a homogenous group when it comes to living cultures. Many of us in fact enjoy living in dense neighborhoods without our own lawn, private drive way or endless buffers of green to protect us. 5) There are obvious environmental and ecological reasons to promote dense neighborhoods. For an exhaustive listing, visit the European Environment Agency website. 6) By introducing dense development, we are able to preserve the recreational forests and open areas people in Helsinki and beyond cherish the most. The Pikku Huopalahti case for example is close to Keskuspuisto, Helsinki’s ‘Central Park’, which acts as the recreational backbone for urbanites and suburbanites alike. 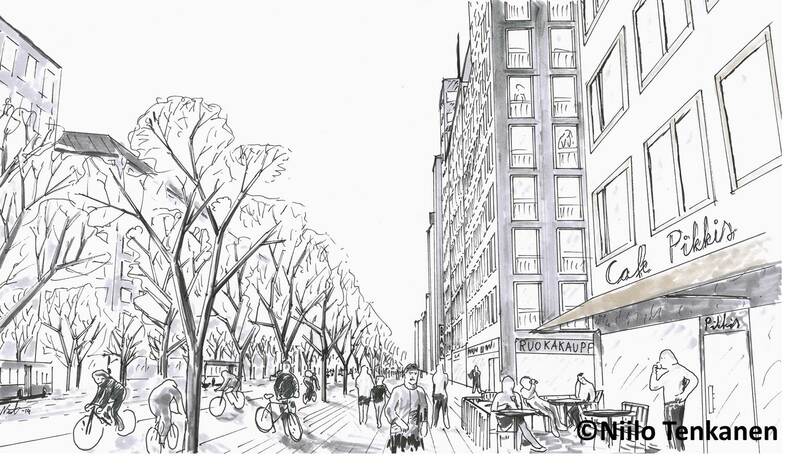 Developing a dense neighborhood here will give many access to a great urban forest and simultaneously save untouched areas elsewhere where apartments for those about 3 000 people who the city considers don’t fit in Pikku Huopalahti would ultimately be built. 7) The city is always talking about promoting walkable neighborhoods and keeping services close to people. Well, this is how it happens. With supportive urban design and sufficient residential density. 8) This piece of land has great potential to become the center for adjacent neighborhoods. When we did a walk through the area and before starting to throw around planning ideas, we asked a woman for advice where we could go sit down for a cup of coffee. She replied “nowhere, there are no cafes here”. This was on a Saturday afternoon. I also talked with a guy the other day who has been thinking about moving just north of the project area but remains doubtful because there are no supermarkets nearby. Talk about a timely project, don’t you think? 9) Cities are the places where people and ideas meet. By developing inspiring and attractive neighborhoods, we are able to foster creativity and innovation. That’s how it’s been for thousands of years. 10) And finally, by adding our over 4 000 inhabitants into the general area of Pikku Huopalahti, we are able to create a threshold of people which would for example exceed the requirements for a subway station in Helsinki (10 000). Less excuses for the city to procrastinate with proper public transport investments. A cross-section view of the area. Apartments on top, offices and retail space below and parking underground. Illustration by Niilo Tenkanen. As said, it’s too early to report what the city thinks of our arguments and if any of it will materialize as such. But it is extremely interesting to see what kind of reactions our initiative will bring about. From a governance point of view, Helsinki is at the moment facing a new kind of buzz regarding its relationship towards the public. In recent years we’ve seen the do-it-yourself, pop-up, and/or self-organizing spirit rise exponentially within the cultural sphere. Concepts like Restaurant Day and Cleaning Day as well as many neighborhood-based community groups such as Kallio-liike have emerged during the past few years and are enlivening the city like never before. A common denominator is that they are independent from and keep a distance to official authorities. Another common denominator is that the soaring community renaissance has happened with the growth and use of social media. Our urban planning initiative also fits into this pattern, because our team was put together with the help of a Facebook group (called Lisää kaupunkia Helsinkiin) for citizens who would like to see a more urban touch in Helsinki’s urban planning. So for those of you familiar with the Swedish context, you could say the Helsinki group is on the same track as YIMBY in Stockholm and elsewhere in Sweden. Traditionally in the urban planning context, public participation has for the most part not been an issue very high on Helsinki’s urban agenda. On the bright side, a positive recent thing is that we’ve moved on from only having staged participation events to using map-based ICT tools for data collection from citizens. Some of the most interesting developments in this field are SoftGIS applications, home-grown at Aalto University. All in all, public administrators within the city’s bureaus are only slowly adapting to the wave of self-organizing groups and initiatives. We’ll also have to wait for future evaluations on how the data collected with ICT tools will end up getting used. The pressure to prove that citizens get their say is in any case growing as community voices are getting louder. Our project falls somewhere in between the do-it-yourself movements and conventional participatory planning. We are close to seeing what happens when a group of citizens who are tired of the business-as-usual and pro-sprawl planning practices get proactive and hijack the municipal planning monopoly. This has never been done before in Helsinki and most likely the entire country so the outcome will be a landmark of its own. The minimum goal is to be able to stir more discussion on how our cities are planned and show that you don’t need to be affiliated with the planning authorities or a business interest to engage with shaping your city. Beyond that, the sky’s the limit. Stay tuned or visit Pikku Huopalahti in 10 years to find out how we do. In the meanwhile, check out our Facebook page for updates and download our proposal for more details (unfortunately only available in Finnish). Please note: All illustrations are © Niilo Tenkanen. The pictures may be used freely for non-commercial blog posting, forum posting and similar publishing platforms with proper crediting. Please contact Niilo Tenkanen (niilo.tenkanen [at] gmail.com) for higher picture quality materials and permissions for commercial uses. This blog is brilliant. As a fellow urbanist and lover of all things Finnish, consider me a new regular reader. Thank you very much! I’ll do my best to keep the flow going. I have been confused by the Finnish cities comments on how should a city be and the development of areas with the exact opposite characteristics for a long time. Finally someone is pointing this out. I hope your ideas of this URBAN planning materialize and Helsinki finally moves to a new decade! I also hope that train traffic, especially metro gets promoted on many new areas in Helsinki region. The planned extensions (tunnels) of Hakamäentie will however require massive grade separated junctions and the tunnel inlets are long, and the whole of it requires buffer zones for the noise and pollution, so in the end only the southernmost blocks could be built. The good in it is that the buffer zones can be used for the parking lots of the new residents. There’s no way the state would let the city curb nationwide connections by blocking the planned development with aparments too close to the highway. Regarding point 3: the expensive inner city apartments can only exist near the city center, few blocks “inner city style” in the outback is not “inner city”. It’s the location, not the style people pay for. You can only build inner city apartments within an existing inner city – Pikku-Huopalahti isn’t such, and is too far away. The edge of “inner city” is at Tullinpuomi, or at most at Tilkanvierto. A “local” inner city would need (comparing to other cities) about 30 000 residents within a walking distance to be self sustaining. Thanks for your comments. Regarding the tunnel, there are no concrete plans to do this yet. And within the current political climate, I doubt such highway-like developments are going to happen anyways. Regarding point 3, the more dense inner city areas grow as cities grow. This project is showcasing how a piece of this could be realized on the northern edge of the city. New development can (and probably will) be introduced also elsewhere between the conventional inner city vs. suburbia boundary and also beyond it in the future. Then this project is no longer such an island. You got to start somewhere.